Also available as a kit (pattern plus 2 balls of Dale of Norway Falk yarn in your choice of colors) from the designer’s website. The “copper” shade used originally is sold out / discontinued. However, you could use any of several other brownish shades, or get wild and use something totally unexpected. Have fun! 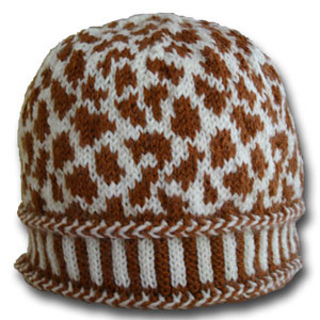 Circularly-knit fair isle hat in adult large, adult small & youth sizes (22”, 21”, 20” circumference).